IPv6 is coming to Bigpipe. We are doing an open beta here on Geekzone. To get this underway, allow me to introduce @IPv6pipe. You can get in on the beta by PMing @IPv6pipe your details, including the email address you use for Bigpipe. Once you’ve PM’d, we will process a batch of subscribers on to IPv6 each day. Please note that the IPv6pipe account won’t be manned according to our usual service hours or SLAs. If you need Bigpipe service unrelated to IPv6, please just go about this the normal way. Please keep posting about the IPv6 beta to this thread only. We will be using the beta and the information from this thread to build our support processes for IPv6 when we have it consumer-ready. We ask very sincerely that you only participate in this beta if you actually know what you are doing with regard to modemy routerish networky stuff. If you don’t know this stuff, we politely ask that you wait until we announce a general release of IPv6 before asking to have it enabled. This will avoid wasting both our time and yours. If you do try to enable IPv6 and you muck it up to the point that your connection stops working, that’s on you. If you get to this point and need us to disable IPv6 on our end for your connection, please again PM @IPv6pipe asking for IPv6 to be disabled. Please do not submit support tickets to our care team regarding the IPv6 beta. That said, screwing up IPv6 is probably nothing that a factory reset, or disabling IPv6 on your equipment won't fix. 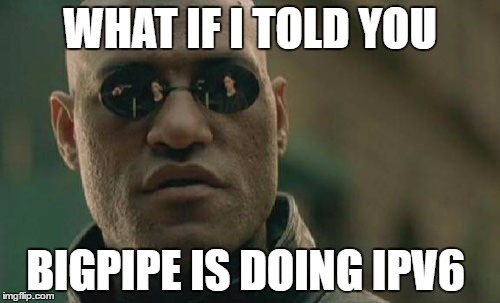 Send @IPv6pipe a PM with the email address you use for Bigpipe asking to have IPv6 enabled. Do I have to have a public IPv4 address to get IPv6? - No, you don’t. IPv6 is available to anyone on our network that opts in via Geekzone for the beta. Can I get a bigger prefix than a “/60”? - No, sorry. Currently we only offer a single “/60” per connection. What does "sticky" mean? Will my prefix ever change? - Your prefix will not change unless we need to change something on our end (for example if you're upgrading from ADSL to UFB). Can I get a truly static IPv6 allocation? Do you support reverse DNS and delegation for IPv6? - No, sorry. Currently we do not support DNS delegation for IPv6 prefixes. Do you know about the bugs with IPv6 on the Bigpipe modem? We know about some issues, but if you find one, please post it anyway so we can deal to it. Thanks for your patience - we know a lot of you have been waiting for this, and we're stoked to get it off the ground! Happy to say I'm currently writing this while connected to Geekzone via IPv6 on Bigpipe! Nice work! I'll update the thread with any problems I discover. Not having quite as much success with pfSense. 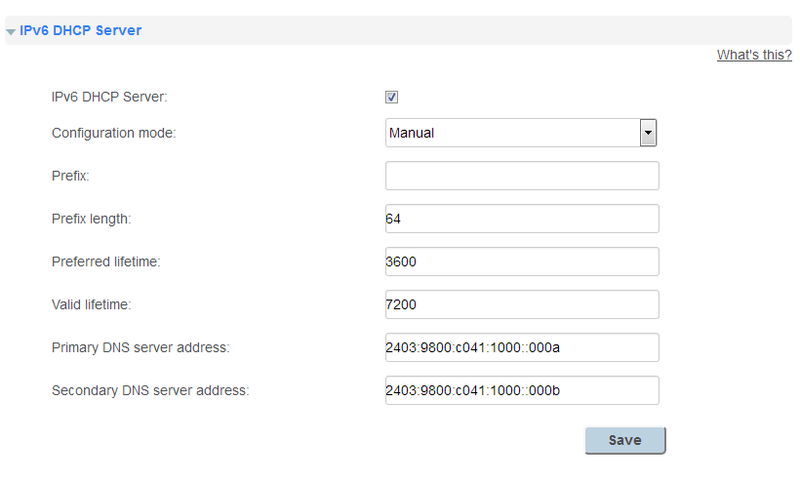 Using DHCP, prefix length of 60, and "Only request an IPv6 prefix, do not request an IPv6 address" option. Still seeing a link local fe80 address only after several connect/disconnects and even a few reboots. Try ticking the "request a IPv6 prefix/information through the IPv4 connectivity link" box. All traffic needs to come in through the same PPP session, both v4 and v6 traffic. I've got a Telecom HG659 and found that I have to set the DHCPv6 server manually as follows: (under Home Network > LAN Interface) Otherwise DNS lookups would take 4 seconds to resolve. No change. I am getting notifications saying PF (the firewall in pfSense) was wedged/busy and has been reset, so I'm rebooting after any change to be on the safe side. Yay for trials, PM sent. SirHumphreyAppleby: No change. I am getting notifications saying PF (the firewall in pfSense) was wedged/busy and has been reset, so I'm rebooting after any change to be on the safe side. I don't have a PFsense box to test with (an available dual NIC PC in this office isn't going to happen) so can't try and replicate this. You could try setting your prefix to /64 (we assign a /60 per line, but you're free to use smaller prefixes, or multiple prefixes on your LAN), as well as requesting an IPv6 address in addition to your prefix. Maybe post a screenshot of the advanced options? Unfortunately, I've now got family nagging at me because I'm fiddling with things, so I'll probably have to continue my efforts in the morning. I'll be able to do a reset and test with pfSense from a completely clean state. None of the extra bits in there look particularly relevant. Maybe fire up a packet capture to check for v6 packets moving? Request only an IPv6 prefix: (unticked). Update - seems to work ticked as well. Try ticking this first as recommended in the first post. One router firmware upgrade later and I'm connected again. The old version had a bug that stopped IPv6 settings from being saved.